DETROIT – She couldn't say the words. Three times U.S. District Judge Gershwin A. Drain asked, "Are you pleading guilty or not guilty?" Each time, Rasmieh Odeh paused. "I think to sign this [plea agreement], it makes me guilty," she finally said. And with that, she begrudgingly ended a nearly four-year prosecution based upon her failure to disclose her arrest, conviction and imprisonment stemming from two 1969 terrorist bombings in Jerusalem when she applied to become an American citizen. Odeh, 69, will be sentenced in August for naturalization fraud. A loss of her citizenship and deportation is guaranteed to be part of that sentence. A jury convicted Odeh in 2014, but she won a new trial in December after an appeals court ruled that testimony supporting her defense was improperly barred. That defense was built around an unproven claim that Odeh suffers from Post-Traumatic Stress Disorder (PTSD) brought on by alleged torture while in Israeli custody. Her confession to the bombings came only after 25 days of torture, she claims. When immigration papers asked whether she ever had been arrested or convicted, the PTSD caused her to filter out that past, Odeh claims, and believe the question only applied to her time in the United States. There were several problems with that theory. Records from her Israeli prosecution indicate she confessed within a day of her arrest. And the immigration official who interviewed Odeh as part of the naturalization process previously testified that she always includes the phrase "anywhere in the world" when asking about an applicant's criminal history. For all her hesitation, however, the plea agreement Odeh signed explicitly dismissed the torture and post-traumatic stress claims. "At the time she made the false statements, [Odeh] knew the statements were false," the plea agreement says. She "also admits that all of these false statements were material ... She made the false statements intentionally and not as a result of any mistake, Post Traumatic Stress Disorder or any other psychological issue or condition or for any innocent reason, and not withstanding any other statement or testimony Defendant Odeh may have made at any other time regarding those answers." Minutes after the hearing ended, Odeh struck a decidedly different tone. Her case made her a heroic figure among anti-Israel activists who organized campaigns to pack the courtroom for each proceeding. About 50 people attended the plea hearing, mostly friends and colleagues who traveled by bus from Chicago. She had no choice but to take the plea, she told them. That echoes the justification offered by her supporters, who issued a statement last month saying it would be impossible for Odeh to get a fair trial under "the regime of racist Attorney General Jeff Sessions..."
"I don't want to leave," Odeh said in front of the courthouse. "This is my second country as well. But they want me to leave because they want to destroy us, to destroy our struggle." Barbara McQuade, the U.S. Attorney when the indictment was issued and during the 2014 trial, also attended Tuesday's hearing despite leaving the post earlier this year. "I wanted to be here to see it through," she said, and to support the prosecutors and the families of Leon Kanner and Edward Joffe, the two college students killed in Odeh's 1969 bombing of a Supersol grocery store. Odeh supporters repeatedly tried to pressure McQuade to drop the case, organizing campaigns to bombard her office with telephone calls and correspondence. "We try to tune out the chatter of public opinion," McQuade said, "and do what we think is right" based on the evidence and the law. After the hearing, Odeh's supporters in the courtroom shouted, "Shame on you" at McQuade. But to one observer, the shame was on the other side. Ann Arbor resident Dan Cutler watched Odeh supporters protest outside of court before the hearing, and give speeches afterward. He stood silently holding a sign playing off the social media hashtag "Justice4Rasmea," which read, "Justice4Rasmea's Murdered Victims. I remember Eddie and Leon. My ❤ is with the families." 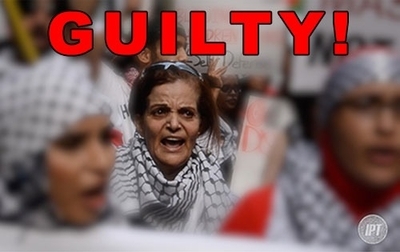 "It makes me very sad" to see supporters blindly stand by Odeh despite evidence of her guilt and her own guilty plea. "I don't hate those people. I think they're incredibly wrong-headed," he said. Basil Joffe, whose brother Edward was 21 when he was killed in the 1969 Supersol bombing, attended Odeh's 2014 trial and Tuesday's plea hearing with his wife and daughter. He expressed relief to see the case come to an end, but was struck by Odeh's reluctance to admit her guilt directly. "There was no sense of remorse or even a freely acknowledged guilt," he said afterward. But, "we're tired of it and glad that it's over." Odeh will not serve additional jail time. She served about five weeks in custody before her first trial, and Judge Drain indicated he would not add to that. She still has a Jordanian passport but is working to find another country willing to take her in. If she cannot set that up, Assistant U.S. Attorney Jonathan Tukel said, Immigration and Customs Enforcement will notify Odeh about the date of her departure and provide her with a ticket. Among the chants supporters repeated before the hearing was, "DOJ, let's be clear. Rasmieh is welcome here."